Bam leads Mac by 12-15 pts. Comparable data from Survey USA on possible Electoral College Votes results as of March. WASHINGTON – Buoyed by enthusiasm among Democrats and public concern over the economy, Sen. Barack Obama (Democrat from Illinois) has captured a sizable lead over Sen. John McCain (Republican from Arizona) at the opening of the general election campaign for president, the Los Angeles Times/Bloomberg poll has found. In a two-man race between the major party candidates, registered voters chose Obama over McCain by 49 to 37 percent in the national poll conducted last weekend. 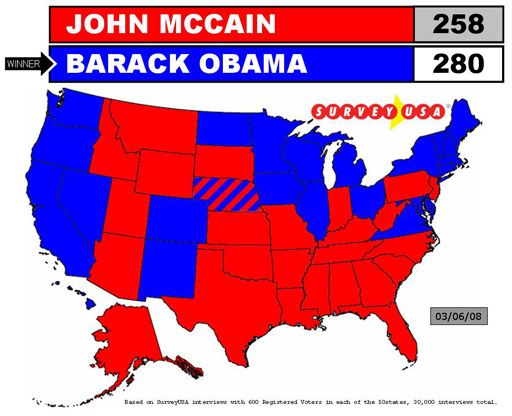 On a four-man ballot including independent candidate Ralph Nader and Libertarian Bob Barr, voters chose Obama over McCain by an even larger margin, 48 to 33 percent. Obama’s advantage, bigger in this poll than in most other national surveys, appears to stem in large part from his positions on domestic issues. Both Democrats and independent voters say Obama would do a better job than McCain at handling the nation’s economic problems, the public’s top concern. In contrast, many voters give McCain credit as the more experienced candidate and the one best equipped to protect the nation against terrorism – but they rank those concerns below their worries about the economy. Moreover, McCain suffers from a pronounced “enthusiasm gap,” especially among the conservatives who usually give Republican candidates a reliable base of support. Among voters who describe themselves as conservative, only 58 percent say they will vote for McCain; 15 percent say they will vote for Obama, 14 percent say they will vote for someone else, and 13 percent say they are undecided. By contrast, 79 percent of voters who describe themselves as liberal say they plan to vote for Obama. Even among voters who say they do plan to vote for McCain, more than half say they are “not enthusiastic” about their chosen candidate; only 45 percent say they are enthusiastic. By contrast, 81 percent of Obama voters say they are enthusiastic, and almost half call themselves “very enthusiastic,” a level of zeal that only 13 percent of McCain’s supporters display. Among white voters, Obama and McCain are dead even at 39 percent each, the poll found. Earlier this year, when Obama ran behind Sen. Hillary Rodham Clinton (Democrat of New York) among white voters in some primary elections, analysts questioned whether the African American senator could win white voters in the general election. But the great majority of Clinton voters have transferred their allegiance to Obama, the poll found. Only 11 percent of Clinton voters have defected to McCain. Nader, a consumer advocate who ran as the candidate of the Green Party in 2000 and as an independent in 2004, and Barr, a former Georgia congressman, both appear to siphon more votes from McCain than they do from Obama. When Nader and Barr are added to the ballot, they draw most of their support from voters who said they would otherwise vote for the Republican. Obama’s strong showing also stems from a broader trend among voters of support for Democratic candidates and Democratic positions after almost eight years of an increasingly unpopular Republican administration. In this national poll’s random sample of voters, 39 percent identified themselves as Democrats, 22 percent as Republicans, and 27 percent as independents. In a similar poll a year ago, 33 percent identified themselves as Democrats, 28 percent as Republicans, and 30 percent as independents. The survey found public approval of President Bush’s job performance at a new low for the LA Times/Bloomberg poll: only 23 percent approved of the job Bush is doing, and 73 percent disapproved. A bare majority of 51 percent of voters said they have a “positive feeling” about the Democratic Party; only 29 percent said they have a positive feeling about the Republican Party. The LA Times/Bloomberg poll, conducted under Pinkus’ supervision, interviewed 1,115 registered voters across the nation June 19-23. The poll’s margin of sampling error is plus or minus 3 percentage points.